The Galway Tent Blog: Crooks or Fools? CBRE -Poolbeg Incinerator, ZOE Developments/Carroll. Crooks or Fools? CBRE -Poolbeg Incinerator, ZOE Developments/Carroll. "It is irresponsible to suggest that the ‘negative equity’ scenario that occurred in the late 1980’s in the UK could occur in Ireland"
Is the public taxpayer in Ireland being seriously mislead by CBRE? If true how many billions in financial damage could this cause to the Irish taxpayer? Did the promoters of the Poolbeg Incinerator give a fair and true presentation to Inspector Thornton of Bord Pleanala? Was the presentation fully honest or just spin, or at best as foolish and 'fanciful' as the evidence given on behalf of ZOE? In August 2009 The Irish High Court and The Irish Supreme Court were presented with 'fanciful' valuations for Liam Carroll's Zoe Developments. 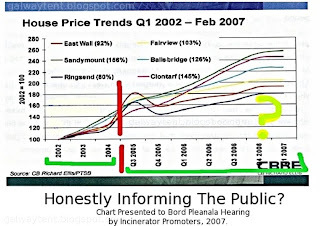 In April 2007, CBRE's Director of Research made a curious presentation to the Poolbeg Incinerator Oral Hearing. Was the Bord Pleanala Inspector mislead at the Oral Hearing? If not mislead was he over-ruled by Board Pleanala Director cronies appointed by friends of the galway tent? Both ZOE and the Incinerator promoters have used the same lawyer. In the two years following the April 2007 incinerator spin and crayon-work posing as research, CBRE's share price dropped from $33 to $2.33. This means Wall Street has less than high expectations of CBRE. Poolbeg Tinkers Curse For Covanta is Bankruptcy? DDDA To Be Sued By McNamara?